Looking for a wear resistant plate that boasts a long wear life and is the only plate on the market to be graded with a hardness level of 600 Brinell? With its peerless mixture of weldability, durability and hardness, Hardox 600 wear plate has taken the development and manufacture of four high mill rolled, quenched and tempered wear resistant steel plate to the next level. Australian Steel proudly supplies Hardox 600 wear plate in a variety of thicknesses ranging from 6-65mm and in 2000mm width. 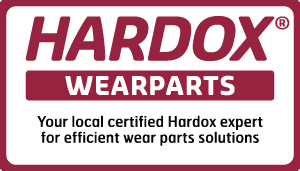 Speak to one of our sales staff to find out how Hardox can help you. Hardox 600 is renowned for being extra hard and durable for applications that cause extreme wear. Despite its hardness, it can nevertheless still be cut and welded, making it a highly favoured choice for a vast range of high-performance applications. However, it should be noted that unlike wear plates of lesser quality, Hardox 600 has been specially tailored for wear applications only. All these advantages combined result in a lower cost per service hour, making it the wear plate that makes sense for your project or workplace. 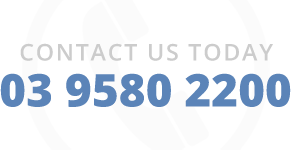 Wear plates are graded according to abrasion resistance (AR), with plates that have an AR score of 400 or 450 being more susceptible to wear than plates with a higher grading. 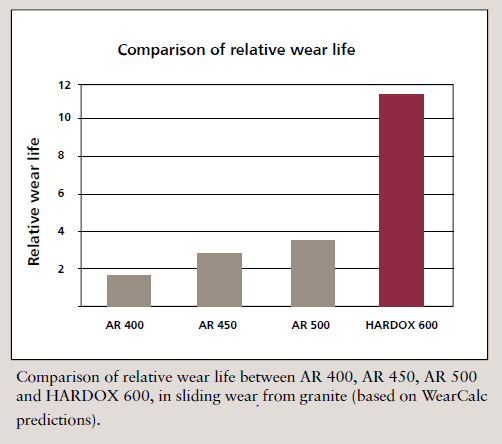 If your plates are subject to sliding wear from very hard abrasives, you’ll enjoy a much longer wear life from Hardox 600 wear plates than from plates with a lesser grading. Hardox 600 has been designed to effectively replace plates of lesser hardness, as well as other wear-resistant products such as hard facing/overlay plates, white iron chromium casting and ceramics. If you’d like further information on this highly durable, abrasion resistant wear plate, download our Hardox 600 product sheets today.